I still remember the first time I saw the Easter Bunny. Not that there was ever a second time and to be honest, it wasn’t really the Easter Bunny. It was rather a 6’2” Scotsman with a really big rabbit suit. The accent gave him away. I knew Santa Claus had a Scottish accent, but the Easter Bunny? No, even at five – I knew better. Our next-door neighbour Philip, was a man of many talents. The most useful was his ability to transform himself into Santa Claus, the Easter Bunny and something that resembled a hedgehog in a two-piece bathing suit. I still don't understood that holiday. Philip had a deal with the parents on our block. They would leave the doors open on the eve of every major holiday, so he could wander through the houses, nibble on cookies, drink some spiked milk and deposit an egg or two for the children. 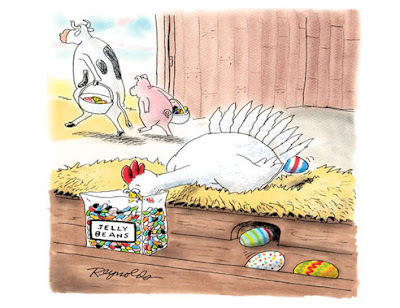 Easter is an occasion of springtime festivals involving yellow marshmallow chicks and pink plastic grass. In Christian circles, Easter is - of course - the religious holiday commemorating the resurrection of Jesus Christ. Then, there is the Jewish festival of Passover, an important feast - linked to Easter by its position in the calendar - celebrated for seven (or eight) days. And, there are many Easter customs and legends that have little to do with Christianity or Judaism. It is believed (by people who think about these things), that Easter originated with Ostra – the Scandinavian goddess of fertility. Ostra was such a cool mythological figure that she had her very own festival and traditions associated with this hip event – like the fertile bunny – still survive today. 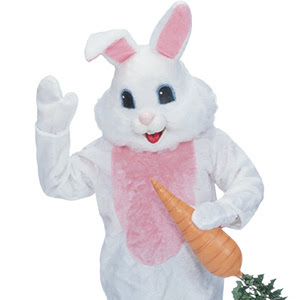 The modern Easter Bunny was first mentioned in writings in Western Europe in the 1500s. Later, in the early 1800s, the first candy bunnies – made of pastry and sugar – were baked in Germany. German settlers then introduced the special rabbit to North Americans and his arrival was considered a really huge deal for kids who believed that if they were good, the floppy-eared creature would lay a nest of multicolored eggs. What farms did these children live on. 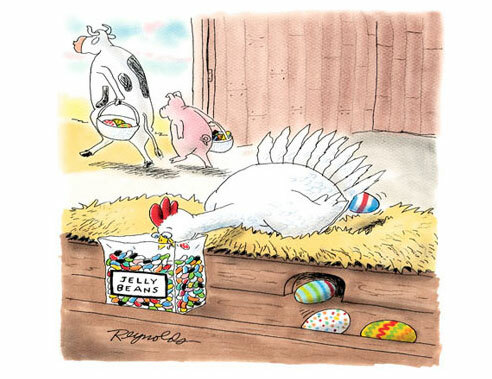 Of all the symbols associated with Easter, the egg is the most identifiable and the easiest to digest - with a little salt, and a dash of pepper. Originally, eggs were painted with bright colors to represent the sunlight of spring and they were exchanged by romantic admirers - much the same as Valentines. Different cultures have their own ways of prettying up eggs. In Greece, eggs are painted crimson to represent the blood of Christ. In parts of Austria, eggs are pierced at the ends and the innards are blown into a bowl. The hollow shells are dyed and hung from shrubs, trees and the tallest girls at the high school dance. Slavic folks decorate their eggs with gold and silver designs and Ukrainians create beautiful works of art using a technique called Pysanski. Then again, maybe that’s just my family.